I always knew that I scratch my skin while sleeping, but I never knew that it was this bad. I always sleep alone, so no one has ever seen me sleeping. One time I was on Skype with my boyfriend and I fell asleep. The next morning he told me that i scratched my face for 10 minutes non stop. I was shocked, I knew I was scratching at night, but not that much! I really am lost. I always wake up with a painful face and neck. Is there a way for me to stop? I've tried pills but they make me eat like crazy, and i don't get my period so I stopped taking them. They didn't even help that much. Help me please I am 20, and my skin looks so bad I'm embarrassed. Very sorry to hear you have bad and scratchy nights. My daughter suffered terrible eczema in her youth and this was her problem too. Been there, tried everything, seen the suffering and trusted the doctors who gave her steroids and horrid paraffin based gunk emollients which did nothing. Few years ago I started to study herbal remedies and learnt so much, it is very interesting, and simple everyday garden weeds can perform miracles.I know better now and every returning mini flair up is treated with Chickweed or Calendula tea. (You make a'tea' from these dried or fresh herbs and let it cool and then dab it like a wash on eczema). My daughter right now has a bout of eye lid eczema which the Chickweed treatment has slowly helped during the day, but in the night time those familiar scratching sessions happen and the eye lids look bad again in the morning. Although, not as bad as the day before and the day before that, as there is improvement every day with the Chickweed, even with these night time terrors. Then, only last week, we discovered Linden tea. It is also called Lime flower tea. It really calms you down and tastes ok. My daughter had a mug of this tea before bed time and slept through without waking to scratch! The next night she did wake up but did not feel a great need to scratch and fell asleep again. Last night, the third night, she slept through again. It is working and the eczema is healing better now when it is left alone. And also, if you get a good night sleep, you are stronger to fight these things.These are early days yet but so far it looks like we have hit on something really good here. I recommend this, have a mug before bed time and see how it goes. i've use plastic wrap with thick moisturiser before, which worked well. The plastic wrap prrvents the skin from drying out and prevent you from scratching. You need help though and it can be uncomfortable to sleep in, but it work for me. I'm really sorry to hear that you're having some issues with scratching at night, and I want to thank you for sharing your story. 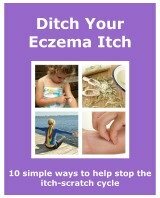 For a lot of eczema sufferers one of the worst times for scratching is when they're asleep. I totally understand your frustration. I would scratch my hands in my sleep, and would wake up with blood on my bedclothes, and an annoyance that after spending so much time treating and managing my eczema I was back to square one. The thing that worked best for me was to wrap my hands in bandages. It is extremely difficult to scratch with a bulky bandage on! Just make sure it covers your finger tips, and that your nails are as short as you can get them. A few other things that can help is to avoid having the central heating on, or turn the radiator off in your bedroom. Drink plenty of water, keep as cool as possible and try and have a window open...although that does depend on where you live and what the weather is like! The most important thing to do is to use an emollient as much as possible. I can understand why you're frustrated about it. If you're feeling stressed about it before you go to sleep find a way to relax before you go to bed. Having a 10 to 15 minute soak in a warm bath with a few drops of lavender oil added to it can help. It helps the body to relax and has a sedative effect that can help you sleep. I'm not medically trained so I don't want to tell you any medications to try as they might not be right for you. For some professional help please visit your doctor, explain how it's making you feel and discuss the pills you were given and their side effects. Your doctor will be able to see if the treatments that you have are working or not, and may look at trying something different. I'm sure that other readers will be able to completely relate to your story. I'd love them to share with you some of the ways that they deal with night time scratching, either for themselves or their children. Join in and write your own page! It's easy to do. How? Simply click here to return to Your Eczema Story.